The recent headlines about the NHS data breaches have highlighted some clear points. GP’s will soon be required to share patient data inside and outside the NHS but this leads to some much needed data security and protection. It is vital that GP’s understand the Data Protection Act and the Freedom of Information Act so that they do not put themselves in any difficult situations. If you download data do you always ensure it is encrypted? Are you using a secure network? If you are working from home it is vital that you have the necessary protection on your computer to ensure that the data you are sending is secure. If you have a fax machine avoid using it for sending confidential information. If you feel that there has been a breach of data make sure that you report it straight away. By having damage control in place you will be able to make sure that you limit the consequences of the data breach. Your staff should know what to do in a case of a security breach that involves important data. Do you know the rules and regulations about data sharing? Everyone in your company should understand what data they can share and what they can’t. 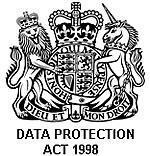 The Data Protection Act is there to protect. Make sure that when sharing data you are not putting anyone at risk. Storage of data should be top of your list. Make sure you are using a third party to store your data. A company that have CCTV 24/7 as well as fire and theft prevention. Here at DataSpace we can’t emphasise this enough. To find out more about how we can protect your data simply call us on 0800 028 8956.